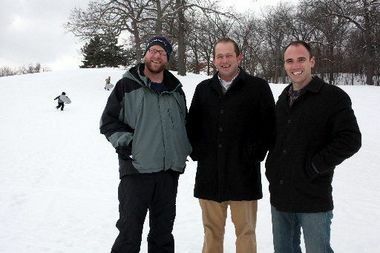 Amanda Loman | Grand Rapids Press Cooking up some fun: Steve Faber, left, director of Friends of Grand Rapids Parks, Paul Knust, center, West Grand Neighborhood Board president, and Kyle Van Strien, vice president of West Grand Neighborhood Organization, stand at the base of the sledding hill at Richmond Park, site of the WinterWest Fest. Snuggie?! And you call yourself a Michigander? With creative souls conjuring up fun outdoor events and sports for all ages, there’s no reason not to grab your cold-weather gear and head outdoors. And with freshly fallen snow resting on branches in woods everywhere, it would be a shame to miss out on all the beauty. Of course, who needs beauty when you’re racing down a sledding hill in a cardboard creation at the season staple Grand Haven Winterfest or the recently announced WinterWest Fest at Richmond Park. In Grand Rapids, Richmond Park boasts the area’s best sledding hill, so it was an obvious location for a new two-week festival celebrating winter weather. WinterWest Fest â organized by the West Grand Neighborhood Organization in partnership with Friends of Grand Rapids Parks and the City of Grand Rapids â kicks off Friday, beginning three weekends of fun outdoor winter activities for families. “We are seeking to add fun to the middle of winter by encouraging people to come out and enjoy the festivities,” WGNO President Paul Knust said. Organizers hope open ice skating, broomball, 3-on-3 hockey tournaments and a “Crazy Cardboard Creation” sled competition will lure West Michigan residents out of their warm dens. Knust sees WinterWest as an inland destination event to have fun while enjoying hot beverages in a warming shelter. Or play broomball. Or hockey. WinterWest fest participation is free for ice skating (bring your own skates) and the cardboard sled race, but there is a $25 entry fee for teams ($5 for individuals) looking to participate in either the broomball or hockey tournaments. The fees will help cover officiating costs. Ice skating and the sports tournaments will be held on two ice rinks created on the park’s grounds for the festival. The Richmond Park pond will not be utilized for the festival this year, though it may become an option in the future, Knust said. The West Side â “Grand Rapids’ new frontier” â is a nice location for people to come to outside the developing Wealthy Street area or busy downtown, he said. And, as previously noted, it does boast the best sledding hill around. “We see this as a way to focus activity, where there’s going to be a level of critical mass around the park. It’s going to hopefully have a little bit more energy to it than it may on just a typical Saturday,” Knust said. One of the festival’s highlights is Sunday’s cardboard sled race at 3 p.m. First, second and third place prizes will be awarded in two categories: Farthest Sliding and Most Unique/Creative. Local celebrities and event sponsors will judge. Prizes will be appropriate for any age and include family four-packs to a Griffins hockey game. As for the rules: Fasten cardboard with duct tape. Wax is fine to use to help with waterproofing. Paint also can be used for decoration. But if you fasten your cardboard wonder to skis or sleds, you wonât be able to compete in the “farthest sliding” competition. Another highlight during the festival, kids and families can skate with members of the Griffins team and team mascot “Griffâ on the one weekday event scheduled for 6 p.m. Feb. 2. As the head hockey coach at South Christian High School and a former Grand Valley State University hockey player, Knust is excited about the tournaments geared toward non-professionals who just want to get on the ice and play. Knust said those attending should dress warmly, but in case of a warm spell, come prepared to have fun anyway. Up-to-date weather questions and information will be posted on the event’s Facebook page.